We all hear stories of healing miracles from time to time, but rarely do we see any real evidence. 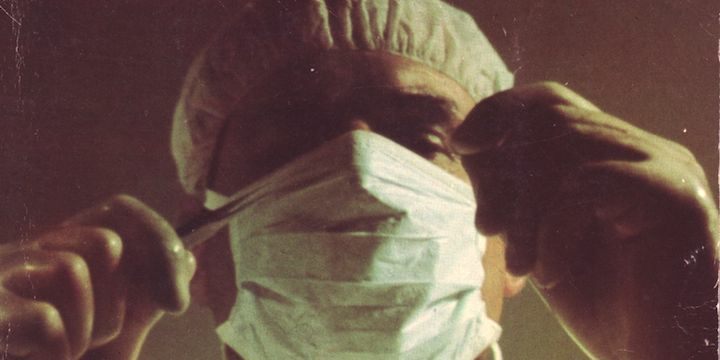 So when a medical doctor obtains the case histories, reviews the evidence, and has his conclusions checked by specialists, we have our evidence. Check out what he found. Dr H Richard Casdorph is an experienced doctor and medical researcher. His CV shows he has published more than eighty research papers in a career that has spanned almost 6 decades, and has earned the respect of his fellow doctors. In the mid 70s he undertook a research project with a difference. He interviewed ten people who claimed to have been miraculously healed of serious conditions. He examined all the case histories – X-rays, medical reports, etc – and also submitted them to medical specialists for review. In all ten cases, the evidence showed that an unusual healing had taken place after the patient received prayer for healing. 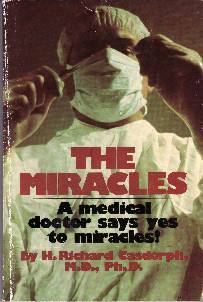 The cases were written up in a book, The Miracles, which includes some of the X-rays. These were the cases ….. or jump straight to what we can learn. Lisa was diagnosed with cancer of the hip when she was 12, and was unable to walk unaided. Her family decided chemotherapy was too traumatic and called it off after one dose. The family were Catholic, though not very religious, and a family friend invited the family to a christian healing meeting conducted by ‘healing evangelist’ Kathryn Kuhlman. The friend fasted and prayed for a week beforehand. During the service, Lisa felt a warm feeling in her stomach, and Kathryn Kuhlman said someone in her section of the auditorium was being healed from cancer and should stand up. Lisa, against her mother’s wishes, stood up and was able to walk without pain for the first time since the problem had appeared. Lisa was X-rayed several times after that, and it became clear that something strange had indeed occurred. Further X-rays (reproduced in the book) were taken and reviewed by several doctors, and these showed that Lisa’s hip had been fully restored and the cancer was gone. In 1970, at age 44, Marie started suffering from severe headaches. She underwent brain surgery, and a tumour was removed, but the surgeons could not remove it all, and the biopsy showed is was malignant. The tumour began to grow back, and Marie was not expected to live. The family decided to spend an evening praying for her healing and her husband stayed up all night. He had a vision of the tumour being healed, but Marie seemed little improved when she woke. However she stopped taking her medication, and continued to improve, as visits to her neurosurgeon confirmed, with some amazement, until she was healed. The book discusses the medical documentation and reproduces arteriograms. When multiple sclerosis first affected Marion in 1958, she was pregnant and not yet 30. She felt numbness in her hands, kept falling over, and generally started losing coordination. But it was not diagnosed for four years, by which time she was deteriorating steadily. Ten years later, she had bad headaches, a deformed forearm, was incontinent, had a marked loss of hearing and vision and was unable to eat or even hold her head up. A friend visited regularly to pray for her and invited her to a Kathryn Kuhlman healing meeting. Marion at first refused to go, but eventually was taken in a wheelchair. She can’t remember exactly what happened, but during the service she found herself standing up, with her back and limbs straight for the first time in years. She began to walk immediately, and later her surprised doctor found she had been healed of all symptoms, including the deformities. She and her husband became strong believers in Jesus. Arteriosclerotic heart disease was (and I assume still is) the most common cause of death in the western world. Marvin Bird had his first heart attack at age 46, and over the next 16 years was hospitalised 17 times because of his heart condition. One artery was completely blocked and the others were half blocked (as shown in angiograms reproduced in the book), but he declined a coronary artery bypass because, at age 60, he didn’t think he would survive surgery. He attended a healing meeting even though he wasn’t then a believer, and an assistant, believing he had been healed, invited him to stand up. He couldn’t previously do this on his own, but now was able to. Doctors later confirmed he was fully healed, and Marvin started to attend church and believe in Jesus. In 1972, Ray Jackson had a kidney removed in the Duke University Medical Center because of cancer. He recovered well, but two years later doctors had to remove a finger because they found cancer had spread there. Shortly after they found cancer in his spine, pelvis, breastbone and leg, and this time surgery was out of the question. (Two bone scans are reproduced in the book.) He was booked in for radiation treatment, but advised he could expect to live no more than a year. Many friends were praying for his healing, and before he began the radiation treatment, he woke in the night to hear a voice tell him he would be healed. The next day he attended a ‘Kathryn Kuhlman miracle service’, during which the pain disappeared instantly. Tests the next day still showed the lesions, but subsequent tests showed that healthy new bone had filled in where the lesions had been. This case is notable because of the wealth of medical detail available from Duke to confirm the healing. Pearl was a doctor of speech therapy who had suffered from a range of medical problems – arthritis, kidney, gall bladder and liver problems – for most of her life. By the time she was in her sixties she had to wear long-leg braces whenever she was out of bed because of weak knees and many falls. Other physical problems (fainting, headaches, nausea and digestrive problems) also worsened at this time. A devout christian, she began praying for healing in her late seventies, then finally managed to get to a healing meeting. During the meeting she felt an unusual ‘grinding’ sensation in her body, beginning with her left hip and gradually moving around her whole body and ending in her neck. She couldn’t take the leg braces off in public to test her healing, but next morning she was able to walk unaided and regained full movement. She was fully healed. Paul, a successful businessman, was admitted to hospital with severe gastrointestinal bleeding after fainting several times. He required many blood transfusions over several days. He had only recently begun to attend church, and his minister visited one morning and prayed for him. The minister said that he had been healed, but doctors would not release him from hospital until his condition was re-tested. All tests showed the bleeding had ceased and there were no abnormalities. Paul’s condition before and after were “well documented by medical records”. Delores had severe spinal problems and pain for years, necessitating four spinal fusions and two cordotomies (a procedure that disables part of the spinal cord to reduce pain but results in no feeling in the legs). For fourteen years she wore a body cast and neck brace to relieve the pain and enable her to walk. At the end of this time, the doctors told her there was little they could do for her, she had so many conditions, but that she could prolong her life by staying still in bed, advice she was unwilling to take. Although she was a christian, she didn’t believe in divine healing, but she was persuaded to attend a Kathryn Kuhlman meeting. She experienced a burning sensation in her legs (the first thing she had felt in her legs for a time) and was completely healed. She was also strongly renewed in her faith. Dr Casdorph says he has medical records for Delores “an inch thick” showing seven serious spinal procedures and the increasingly desperate medical diagnoses, culminating in the doctor’s acceptance that she had “gotten an excellent result physically”. Ten people, all prayed for by christians who believe in divine healing, all healed. That is surely enough to make any open minded person think. At the very least, we can say that something quite unusual happened in each case. Coincidence? The odds seem against it. Poor diagnosis? Ditto. Lies? The documentation suggests not. Real miracles? It seems likely! I suggest we can draw the following conclusions. The probability of natural remissions seems remote, and the most believable explanation is surely that these were indeed cases of divine healing. In many cases, people prayed for some time before the healing occurred. We should be encouraged to pray when loved ones need healing. They may not receive the healing they are seeking, but it is possible that they may. Graphics are taken from the cover of Richard Casdorph’s book.